Marcela Caprario was thrilled with Wednesday's verdict. 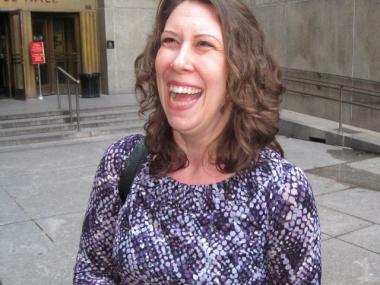 MANHATTAN SUPREME COURT — An amateur opera singer has been found not guilty of assaulting a physician in the frozen food section of the Upper West Side Trader Joe's, a Manhattan judge ruled Wednesday. Teacher and aspiring opera diva Marcela Caprario, 37, was on trial for slapping Weill Cornell Medical Center physician Cathleen London on her right cheek on Jan. 9, but maintained during the one-day trial that she was the victim, not the assailant. "I feel that the judge heard all of the evidence and she saw I was right," she added. 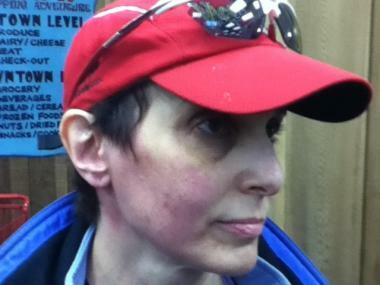 Cathleen London after a smack to her face inside Trader Joe's. Caprario said she has no hard feelings against her accuser or the accuser's two teenage children who testified yesterday that their mother was unjustly attacked. "I'm really over it. I've been over it," Caprario said, adding, "I would say say it was a little hard to listen to [London] saying things about me that are not true." Caprario's attorney, Mark Bederow, said his client did nothing wrong and that the misdemeanor assault and harassment charges should never have been brought. "What she did was legally appropriate whether people like it or not," he said. London and her sons told a very different story — that she calmly tried to diffuse the situation and that Caprario and her husband were out of line. The doctor, who often appears on TV as a medical expert, was not present in court for the bench verdict by Manhattan Criminal Court Judge ShawnDya Simpson on Wednesday.